In 1924 the family of W. J. Harris secured a site in Barlby Road in order to build a small Chapel. The family owned grocery shops and a hardware shop in North Kensington (St Helen’s Gardens and Latimer Road) and they felt there was a need for a local place of worship. It was a Non-Conformist Chapel of the Open Brethren. The building was a large hall and had a Baptistry for total immersion. In 1937 the ground rent payable was £5 a quarter and insurance was £1-12-8 for fire and contents. Bethany Hall was run by a group of Elders who made all the decisions and invited speakers. On a Sunday three services were held, one of which was a huge Sunday School and there was a meeting for women on a Tuesday. There was a club for boys and one for girls to which quite a few of the poorer children from Latimer Road and Snarsgate Street would come. Outings to such places as Gunnersbury Park and Chessington Zoo were held for the children often going by double-decker bus. There were also Magic Lantern parties with paste sandwiches and sweet tea from a blue enamel teapot. Children would recite verses and they would sing choruses. During and just after the war there were German prisoners of war living on Wormwood Scrubs, all older men and they were allowed out to attend Church Services. Sometimes they would join the families for Sunday lunch. In 1941 the building was damaged having all its windows blown out by a land-mine which dropped on Kensington Memorial Park. They were given a grant to repair them. 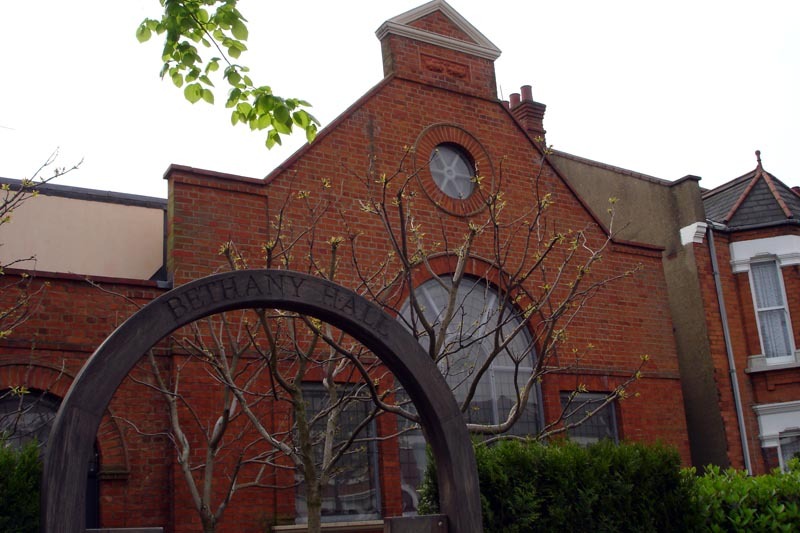 By 1986 the local community had changed, the leaders had moved on and Bethany Hall had to close its doors and subsequently was sold. The building is still there on the corner of Barlby Road and Pangbourne Avenue and the entrance gate retains the original name. As recalled by Ruth Anderson whose grandfather was one of the founders of the chapel. This entry was posted in Streets, Uncategorized and tagged Barlby Road, Bethany Chapel, Memorial Park, Pangbourne. Bookmark the permalink. I remember this chapel very well, All my children use to go to Sunday school here. It was such a shame to see it close and then sold off only to be converted into living accommodation ( house ) .. I used to attend with vi and rons children along with most kids. I had many fun times at Bethany hall. Going to Sunday School every Sunday, our house was accross the road..Those stories and values will remain with me all my life . Maybe you can add some of your own memories as we have very few of Bethany Hall. Just write them as comment. Sue – from the blog.